The warmth of a carnauba with the gloss of a sealant, specially formulated for your boat or RV! You bought your boat or RV to use your boat or RV — not to spend all of your time maintaining it! McKee’s 37 Marine & RV Carnauba Sealant Wax provides protection that lasts the long haul, allowing you to spend more time enjoying your boat or RV instead of waxing it over and over again. The polymer sealants make it possible to get incredible results that LAST! 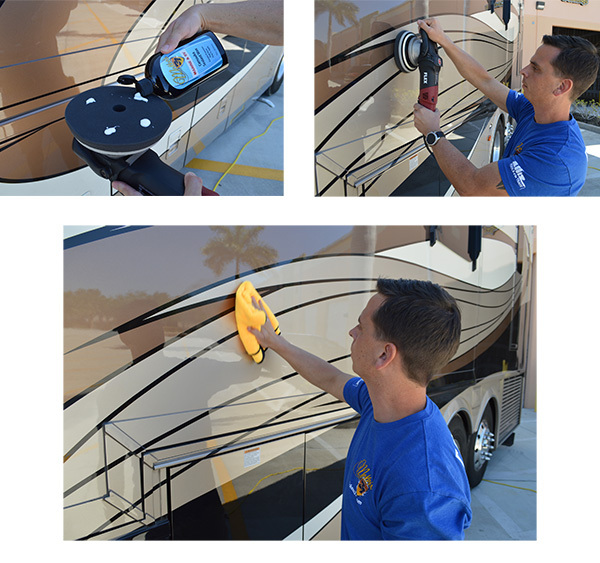 Not only does McKee’s 37 Marine & RV Carnauba Sealant Wax provide protection that lasts, it also works hard to keep your RV cleaner in between washes. The wax creates a slick surface that dirt and grime can easily be removed from. We call this a self-cleaning effect, and it makes your boat or RV considerably easier to maintain. Since nothing will stick to the surface after applying McKee’s 37 Marine & RV Carnauba Sealant Wax, you’ll be able to wash away bugs, oil, road film, and other contaminants with ease! For marine and RV protection that lasts, uses McKee's 37 Marine & RV Carnauba Sealant Wax! 2. Apply by hand or machine with a soft foam applicator pad. A thin coat is all that’s needed! 3. Allow product to dry to a haze for 15-30 minutes depending on temperature and exposure to sunlight. 4. Remove wax using a clean, soft microfiber towel. Flip towel often. Tip: Before attempting to wipe the surface clean, swipe the surface with your finger. If the wax smears then it is not time to remove, if it swipes clean then proceed to buff the panel to a shine. McKee's 37 Marine & RV Mildew RemoverMcKee’s 37 Marine & RV Mildew Protectant SprayMcKee’s 37 Marine & RV Water-Resistant Vinyl ProtectantMcKee’s 37 Marine & RV Gloss Enhancing Final PolishMcKee's 37 Marine & RV Hydro Pearl Sio2 CoatingMcKee's 37 Marine & RV Final Step Detail WaxMcKee's 37 Marine & RV All-In-One Fabric & Vinyl CleanerMcKee's 37 Marine & RV Carnauba Wash & WaxMcKee’s 37 Marine & RV Heavy Duty Cleaner WaxMcKee’s 37 Marine & RV Repel Glass & Plastic CleanerMcKee’s 37 Marine & RV All Purpose Surface CleanerMcKee’s 37 Marine & RV Bug Remover & Wax RestorerMcKee’s 37 Marine & RV Vinyl Decal & Graphic RestorerMcKee’s 37 Marine & RV Heavy Cut Oxidation RemoverMcKee’s 37 Marine & RV One-Step Polish & SealantMcKee’s 37 Marine & RV Repel Glass & Plastic Cleaner 128 oz.McKee's 37 Marine & RV Final Step Detail Wax 128 oz.McKee's 37 Marine & RV Carnauba Wash & Wax 128 oz.McKee's 37 Marine & RV All Purpose Surface CleanerMcKee’s 37 Marine & RV Bug Remover & Wax Restorer 128 oz.